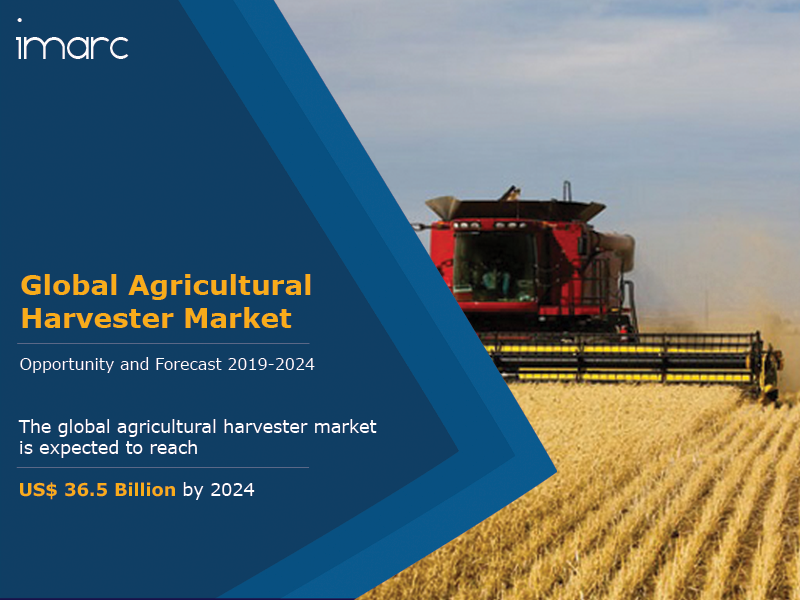 The global agricultural harvester market was worth US$ 26.2 Billion in 2018. Agricultural harvesters are employed by farmers to harvest grain crops. They perform three major tasks – reaping, threshing and winnowing. These harvesters are used to increase farm production in a short time and their utilization has proved to be better than conventional harvesting methods. Moreover, agricultural practices are steadily becoming dependent on machines and tools, such as harvesters, as they help to minimize farm drudgery, enhance productivity, lower crop production costs and significantly bring down harvest losses. Several regions across the globe are experiencing a shortage of labor force which has led farmers to make a shift towards mechanization. In line with this, numerous governments are promoting the use of equipment to boost farm output. They are offering subsidies and necessary training to farmers which, in turn, is propelling the sales of these harvesters. Furthermore, vendors are consistently upgrading their equipment with telemetry and intelligent sensing technologies to enhance convenience and efficiency. Other new features such as GPS and navigation systems have also been incorporated in these harvesters to help in carrying out operations with more precision. Other factors driving the demand of harvesters include increasing food demand, rising rural incomes, increasing adoption of modern farming practices, etc. Looking forward, IMARC Group expects the market to reach a value of US$ 36.5 Billion by 2024, exhibiting a CAGR of around 6% during 2019-2024. The report has also analysed the competitive landscape of the market with some of the key players being Deere & Company (John Deere), CNH Industrial, AGCO Corporation, CLAAS, Mahindra Tractor, Krone North America Inc., Yanmar Company Limited, Bernard Krone Holding, Alois Pottinger Maschinenfabrik Ges.m.b.H., Dewulf , Foton Lovol International Heavy Industry, Lely Group, Ploeger Agro, Preet Agro Industries, SAME Deutz-Fahr, Sampo Rosenlew, MASSEY FERGUSON, etc. How has the global agricultural harvester market performed so far and how will it perform in the coming years? What are the key regional markets in the global agricultural harvester industry? What is the breakup of the market based on the drive type? What are the various stages in the value chain of the global agricultural harvester industry? What are the key driving factors and challenges in the global agricultural harvester industry? What is the structure of the global agricultural harvester industry and who are the key players? What is the degree of competition in the global agricultural harvester industry? What are the profit margins in the global agricultural harvester industry? 14.3.6 Krone North America Inc.
14.3.9 Alois Pottinger Maschinenfabrik Ges.m.b.H.